Following up the recent launch of the iPad version, comes this pocket friendly update for iPhone. * Free Dropbox account required. d(- -)b, the first Modular DJ App for the iPad. 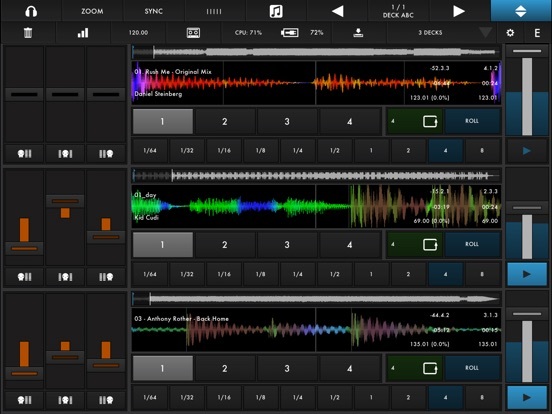 Mаԁе bу thе people behind touchAble, d(- -)b provides endless possibilities for DJs with an iPad. Its modular approach lets the app adapt to the user, not the other way around. DJs can choose from pre-installed templates or create their own interface with up to 6 decks – on one or several pages – making it the perfect tool for any use-case. on some devices (especially ipad3) the app can currently crash while loading – an update that fixes this issue has been sent to apple and is waiting for approval at this time – we are very sorry for the incovenience – and would like to thank you for your patience! 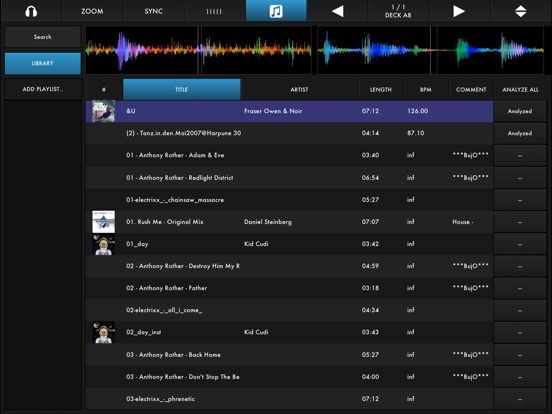 The comprehensive in app editor makes it simple to configure your very own DJ setup. The numerous modules include everything a DJ needs, and allow for an incredible amount of flexibility and customization. With beautiful color-coded waveforms instead of fake vinyl platters, and accurate tools for both worlds of beat-matching: Grid & Sync or Pitch & Nudge – it opens the door to a whole new world of touchable DJing. With support for Multi-Route Audio, d(- -)b turns the iPad into into a professional DJ setup – powerful, customizable, portable. Introductory Price of $9,99 – get it while it lasts! TOUCH THE GROOVE. The world’s #1 pro DJ software now brings high-impact DJing to iPad. Touch your tracks, loop, scratch, and create stunning mixes in seconds. Traktor DJ requires iPad 2 or higher. Playing with your music just got a whole lot more fun! This complete DJ app includes two fully scratchable turntables, a microphone, an effects unit, an equalizer, and a mixer! Pull in music from your music library with the tap of a button, adjust the equalizer, apply an effect, then cut, scratch, and mix to your heart’s content. Easily Mix your music or let Clip DJ automatically mix your music for you. Ever wanted to automatically songs and set how long each song is played? Clip DJ will do that for you! Includes a sampler pad to play beats, sounds, and loops while playing your favorite songs! – Two decks to mix your music from. Simply tap the plus button above the toggle pads to add the song. – A cue button for each deck, the red button is to set your cue and the black button next to it is for cueing it up. – Level adjustment for each deck. – Track total time and current location displays below the toggle wheels. – A fader to easily switch to the next song with ease. – Includes 28 drums, dubstep wobbles, and sound effects. – 10 Hip Hop and Dubstep Loops. – Play/Stop buttons to control each of the music decks while playing drums, beats, effects, and loops. – Use the volume slider to control the volume for drums, beats, effects, and loops! – Many more features are coming soon! 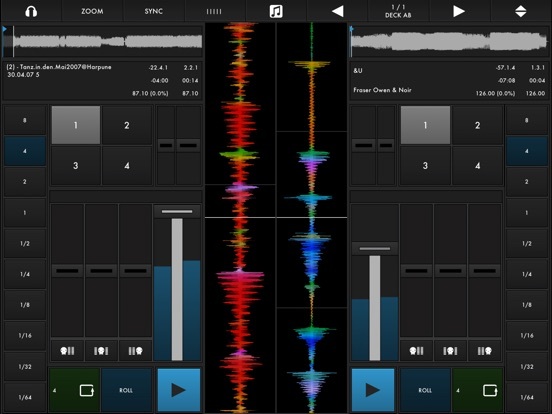 PodDJ is a new DJ application that transforms your iPad into a real mixing engine. Thanks to the design and the perfect fluidity of the display, you will be facing the most realistic virtual turntable you have ever seen. Moreover, iTunes library music becomes available directly without any loading delay and with the highest fidelity sound processing. Discs and controls have been thoughtfully placed in a way that your hands will cover every feature you need as quickly as possible without the requirement of any additional device to achieve a perfect mix. PodDJ is the only application of the App Store with which you can truly scratch on your iPad thanks to a brilliant touch to sound reactivity. Test and see the difference! The simplicity of use will finally inspire the DJ sleeping inside you to wake up and turn your living room into the club it ought to be! LiveFX is a Dynamic Effects Processor for iPad. Any audio source can be processed; use either live sound input, the built-in track player that plays from your iTunes library or Audiobus to stream audio through LiveFX. Create your own combination of audio effects, and simultaneously control up to four effects using a single fingertip (over 1000 possible combinations) or use multi-touch for automated dynamic sound effects. Make music with features that truly stand out from the crowd. Introducing LiveFX for iPad; it’s sound control evolved to a whole new level. Attention: In this free version you are limited to three built-in tracks. Audiobus and live input will work but with a limited time slot. Through in app purchase you will be able to remove all limitations. Elephantcandy takes dance music a step further using the iPad and smart, ultra interactive, software. This will create a whole new range of possible sounds and ways for the DJ/music scene to explore their creativity. An iPad with LiveFX becomes an instrument with no limits. Turntable is the first professional DJ deck for iPad. It is designed, optimized and developed by professional DJs. With high stability and ultra low latency, it is tailored for a live use and fits perfectly with DJ hardware such as mixers or effect boxes. It interfaces with your audio library and uses the highest audio quality (up to 192khz, 32 bit). The application currently works only with iOS 6. An update will add iOS 5 and 4.3 support. – Most accomplished and precise scratch emulation. – Extremely precise waveform, combined with three zoom levels. – Precise Cue, instant Cue/Play. – Pitch Bend : 6, 8, 10, 16, WIDE with pitch reset function. – Beat detection for a precise beat match. – Smart loop length – modify on the fly, adjust with IN / OUT buttons and divide/multiply. – IN/OUT loop cut selection. – Phaser, Beat Roll and Beat Gate are quantized to match beats. – Browse all tracks or a particular playlist. – Tracks played during a same session are highlighted. Experience Oliver Huntemann like never before, with the NEW interactive music album App by Reactable. With the Reactable Artist Edition you can play and remix in real time along with Oliver Huntemann’s performance or just listen and enjoy the tracks of one of the best electronic music producer touring today. This special release converts the top-of the charts recordings of Paranoia into an interactive album. Get access to original samples, transform and combine them, add loops, effects and more, creating unique Oliver-and-you tracks, or simply just watch and listen to the tracks performed on Reactable mobile. • Generate sound with a set of objects including synthesizer, oscillator, sample player and various loop players. • Modify generated sounds with a set of effect objects including wave shaper, delay, modulator and filter. • Modify other objects parameters with a set of controller objects including sequencer and LFO. For iOS beat mixers, the options for serious music mixing just keep getting better, and IK Multimedia, as usual, are ahead of the game. Following up the release of their iPhone DJ Rig app in March this year, comes the launch of a dedicated iPad version, plus the world’s first mobile mixer aimed at iOS users. Expanding it’s ever increasing line of music related hardware products for iOS, IK Multimedia’s latest gem is a versatile mobile mixer aimed at DJs, though it could be used for a range of other audio mixing situations, both iOS app related and just general audio mixing duties. The iRig Mix is both light and portable, making it ideal for on the go mixing almost anywhere, as well as DJ set ups that are tight for space. On the DJing side of things, the mobile mixer features a full-size standard cross-fader control which allows you to swap and blend the audio between the two main inputs. There are also two full size volume faders for adjusting and balancing the two main audio input signals. Beside both faders are also a series of 4 LEDs per channel that indicate the amount of level coming from each input. Also crucial to DJing, are the Cue (or pre-fader) buttons for each channel, which enables tracks to be auditioned through headphones without the audio going out the main output. Then each channel has independent Bass and Treble controls, plus an input Gain control. There is also a master output volume control as well. There are several unique switches on the top of the mixers, but I’ll come back to those shortly. On the back, you’ll find a pair of 3.5mm inputs, and unbalanced RCA stereo outputs. The necessary cabling for connecting 2 stereo audio sources and hooking the mixer up to a sound system are conveniently included with the mixer, which is a nice touch. As the mixer requires power, there is also an On/Off switch at the back, and rather than a proprietary type of connector, the included power supply utilises a standard Micro-USB plug, which means you could also use a stand alone battery powered product with a Micro-USB connector to juice up the mixer, so long as it can generate at least 2.0A to ensure smooth running of the iRig Mix. At the front end of the mixer is an extra unbalanced mono audio input with its own volume control, designed for plugging in either a microphone or an instrument. There is also a headphone output, and this is independent to the master output. Now depending on your main use for the mixer, and the setup that suits you best, there is a great feature that has been included on the mixer that simply lets you select between one and two iOS devices for the audio source. If you have two independent audio sources, such as two iOS devices, or even just one plus another MP3/CD player, laptop, turntable, or whatever, you plug them into the two individual stereo inputs at the back. If you only have one iOS device, however, there is a switch on the mixer that allows you to send two tracks from the one iOS device to the two channels on the mixer, albeit, in mono though. This is one of the unique features of the mixer, though it only works through IK Multimedia’s own DJ Rig apps as the software has a special setting within it that needs to be selected to enable this feature. The other unique feature of the iRig Mix of note is the X-Sync option, which some seasoned DJs will no doubt scoff at, but it will be a lifesaver for budding bedroom beat mixers. When enabled on the mixer, this works in conjunction with the DJ Rig app, and helps to automatically sync the BPM of tracks from different audio sources to the tracks playing from within the app. Naturally it can’t adjust the tempo of an external audio source, but it does change the speed of the tracks being played from within the DJ Rig app. You can easily disable it, but good on IK Multimedia for including it for the rest of us who could some help getting the beats in time. As for the general build of the iRig Mix, it feels nice and sturdy though I don’t know how well it would hold up week after week in a professional night club environment. It’s clearly not designed for professional set ups, but that doesn’t mean you can’t get professional sounding results from using it. And with the proper care and sensible use, I can’t see why it would cause any problems well beyond the warranty period.